An idea shared by one volunteer turned into a great event! One of our volunteers had participated in the Oklahoma State Fair Creative Arts Division competition last year, in addition to all the normal categories she really enjoyed giving to the charity division. In 2015 there was one charity: Infant Crisis Services, participants could donate lots of different baby items to the fair that were then given to the organization. This Spring she asked what we thought about seeing if Threads of Compassion could be a category at the fair for people to enter. We loved the idea and were so glad to have her contact the fair officials and get the ball rolling. The people in charge were willing to add us and have 2 charity categories this year. In the end three of us worked together to get the proper information to the fair and it happened! It was so exciting to see Threads of Compassion listed in the booklet for all to see! 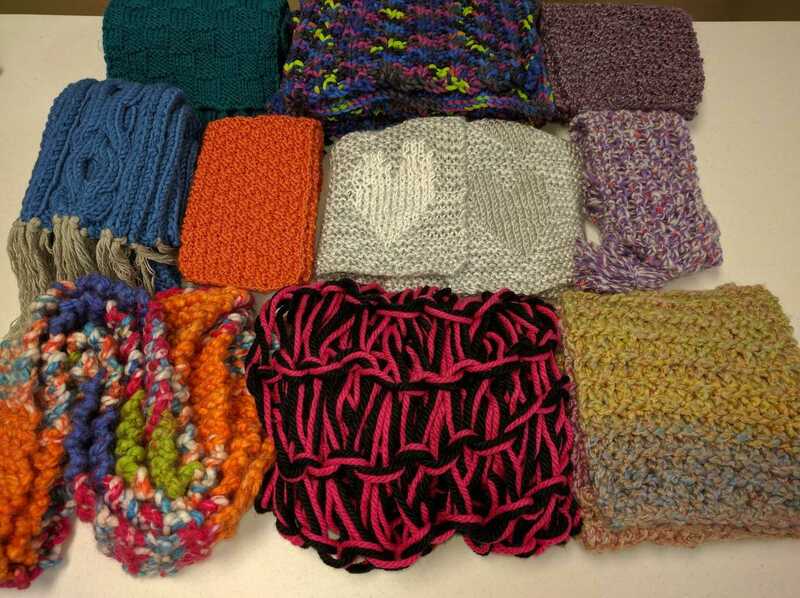 We are thankful to have received 36 scarves (11 knitted and 25 crocheted) donated by volunteers both old and new to Threads. In addition to seeing the great quality of work we also are glad to have so many people who are new to Threads participating with us. Each scarf was awarded a specially made blue ribbon titled “Fair Compassion”. In addition to that the top 10 in each category was awarded a ribbon corresponding to it’s place as well. Next PostNext Do you have a favorite pattern?